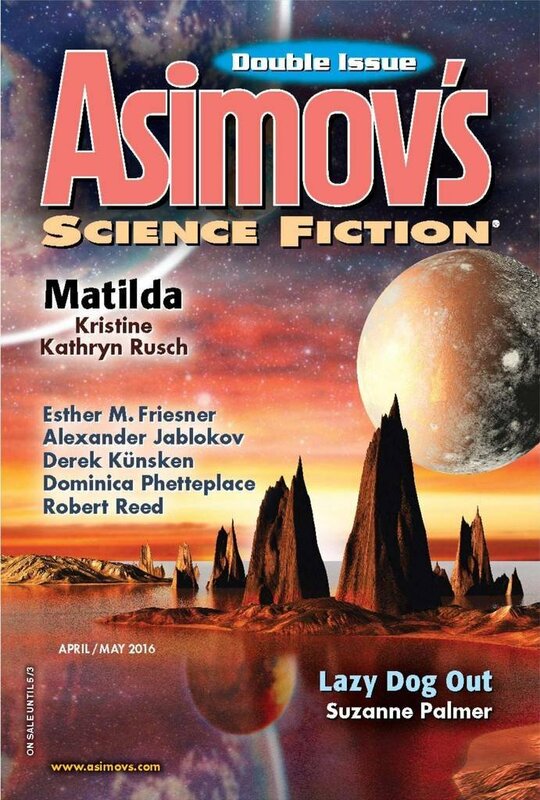 "The Return of Black Murray," by Alexander Jablokov, appeared in the April/May 2016 issue of Asimov's Science Fiction, published March 24, 2016, by Penny Publications. Pro: The setup is wonderful. The flashbacks work very well. Up until near the end there's a good bit of suspense as to whether there's going to be something down there or not. Con: And then it fizzles. Nope, no monster anymore. Just an old purse. And then everyone got new careers. No obvious connection between any of these things. Not even a symbolic one. Really didn't work for me. It's one of those stories trying to build up importance by speaking about something ominously over great lengths of time, which effectively wind up being "I wait patiently until we reach the end of the story and the author deigns to reveal what the heck it was about." No speculative element at all until deep, deep in. Black Murray isn't even mentioned until 37% through. The characters and dynamic and backdrop are all well and dandy, but this stretches those on and on until it finally goes for "And then, 25 years ago, something scary and supernatural happened for two minutes." Good characters. Good tone. Good attention to detail. But no story. You can get away with that in something short, but not at this length.